Hello Woodworkers and Woodturners everywhere! 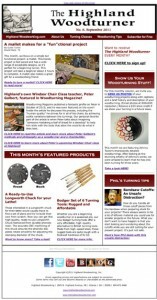 We are pleased to announce that the September edition of our woodturning newsletter, The Highland Woodturner, is out and ready for you to read. This month we have a new column from Curtis Turner, who walks you through the steps of turning a simple mallet. Curtis includes pictures and some great technical tips for creating this ‘fun’ctional project. And he is CERTAIN that you will be a pro with the skew chisel in not time. We’ve also got a new Show Us Your Woodturning column, featuring extraordinary works by a UK-based woodturner, Johnny Taylor. We were amazed to learn that Johnny has only been turning for three years, and you will be too once you take a look at his stuff. Top that off with a couple great turning products, a new tip from Phil Colson, the resident woodturning expert at Highland, and a fascinating article about Peter Galbert, and you’ve got a great read! Check out The Highland Woodturner today!